Only two more days, and we will publish the travel plans of Río Wang for this year. But to give a foretaste to our readers, we already publish the program of the “East Unlimited” tour, organized by us for the Hungarian Jewish Cultural Association from April 4 to 11, during which we will mainly track down the forgotten Jewish past of the region over the Carpathians. For the readers of Río Wang we will announce the same route for the end of April. The thousand kilometers long road, which, at first glance, meanders back and forth with the irresoluteness of the billiard ball over the borders of the countries apparently invented by Shakespeare, is in fact the most resolute route from the Ukrainian border to Odessa. The way through Cluj and Chisinău would be about a hundred kilometers less, but who is willing to enter the Eastern Moldovan or Transnistrian Republic, not recognized by anybody and therefore not marked on the map, where you are suspicious if you enter without smuggled goods, and will taken to pieces together with your vehicle? 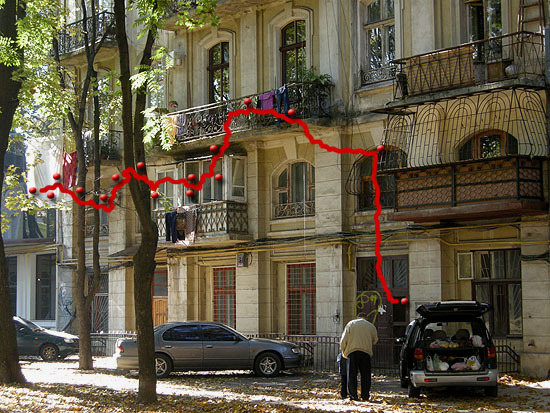 Or, some might say, why do we make such a detour after h Hotin, why don’t we go along the Moldovan border to o Odessa? Well, apart from the fact that in this way we would miss k Kamenets-Podolsk and the Hasidic Jewish pilgrimage sites m Medzhibozh and n Uman, we have already done this trip through the poorly maintained mountain roads of the Pre-Carpathians, through the impressive dam of the hydroelectric plant of Novodnestrovsk, across the border station of Mogilov-Podolsk rivalling Ádám Bodor’s famous Sinistra District in depression, and we would frankly not want anyone else to do it, only to make a half-day extension to visit the intactly preserved shtetl of Shargorod, which we will be therefore forced to miss. Again others after d Terebesfejérpatak/Dilove usually put the obligatory question as to why we would not make a sixty-kilometer abbrevation towards g Kuty. Well, not because the shorter road offered along the swift water of the Cheremosh exists only on the Ukrainian road maps, while in the reality the Cheremosh washes off at least half of it at every spring thawing, so in the rest of the year it works as a dirt road viable at a maximum speed of 5-10 km. And oh well, we could spare the forth three, back two-day long bus trip in a primitive way, to take a flight or an overnight sleeper, say, from Lwów, but then between a and o we would not see all the many letters, which are the most beautiful, historically most memorable Jewish sites of this Subcarpathia-Bucovina-Black See journey, and which we describe below. a) Beregszász / Beregove / בערעגסאז. Within less than ten kilometers after crossing the border, we arrive to one of the major centers of Subcarpathian Hungarians and former Subcarpathian Jews. We stop by only for a short time, to change money, and to look around in the main square, still determined by the impressive building of the former Great Synagogue, in 1969 converted into a socialist realist house of culture. b) Huszt / Khust / חוסט. The places marked in blue on the map – which could be much more – indicate those major sights where we cannot stop or only for a shor while, due to the lack of time, but along the way we will give a detailed report on them, and most of them we will see from the bus. Besides the ruins of the medieval castle, popularized by the most emblematic Hungarian romantic ode, Huszt also has a beautiful medieval church and an orthodox synagogue, about which we will also speak. Along the way we will also present Nagyszőllős / Vinogradov / סעליש, which was recently presented in a beautiful album of archive photos by a native collector now living in Israel, commented with his memories, about which we will soon write in Río Wang. c) Técső / Tyachiv / טעטש. Here we just pass by the impressive synagogue converted into a sports club, and recall the old Rusyn musicians of the Band of Técső, who preserved for us the Jewish folk repertoire of the region – similarly to the Gypsy musicians in the southern, Romanian part of Maramureș, visited by the Muzsikás Ensemble –, and with whom the renowned klezmer musician Bob Cohen used to play live and publish common albums of folk music albums. d) Terebesfejérpatak / Dilove, center of the world. Or at least of Europe. Here was established – according to the label of the obelisque, “with an extremely precise Austro-Hungarian leveler, according to the European grades of longitude and latitude” – the geographic center of Europe, marked by an earlier Latin, a later Russian, and a modern Ukrainian inscription. The exalted sense of the Mitte will be increased by the adjacent large and splendid Rusyn restaurant and folk art museum, where we will spend the first day lunch. e) Kőrösmező / Yasinya / יאסנעה. Although marked in blue, if time permits, we will stop to commemorate and to say Kaddish in front of the memorial plaque of the local railway station to the eighteen thousand Hungarian “stateless” Jews, who in the summer of 1941 were handed over here, at the old-new border of Hungary, to the German authorities who then deported and killed them in Kamenets-Podolsk. Time now will not allow us to visit the beautiful nearby Jewish cemetery or to walk up to the source of the Tisza, the second largest river of Hungary, but we hope that we can make up for it soon at a Maramureș tour. f) Kolomea / קאלאמיי. By leaving at the Tatar Pass the territory of the former Kingdom of Hungary, we arrive to the historical region of Podkutia, situated between Galicia and Bukovina, whose center was Kolomea, a trading town inhabited by a Jewish majority and a Hutsul minority. The Jewish historical monuments of the city were completely destroyed by the Germans and the Soviets, thus we only pass through it, so that we can arrive to Kuty at daylight. g) Kuti / קוטוב, but we may safely add also its Armenian name, Կուտի, as this little town was mainly inhabited by Hasids, Armenians and Rusyns, had the glory of becoming, in the last days of September 1939, the capital of Poland, before the Polish government emigrated from the coordinated attack of Soviet-German forces over the bridge of the Cheremosh to Romania. 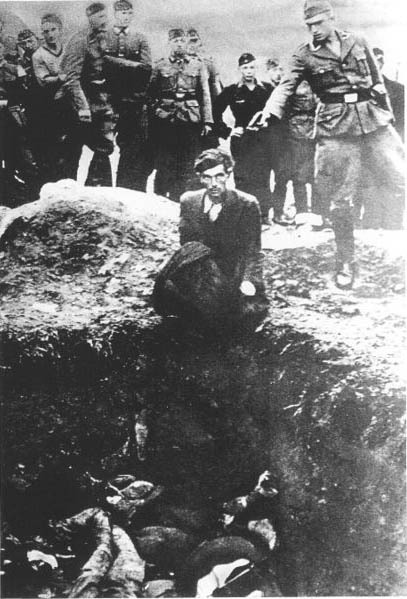 The Cheremosh, which from 1920 until WWII was the border between Poland and Romania, in particular between the settlements of Kuty and Vizhnitsa, whose Hasidic community was undivided in Austro-Hungarian times, gave a boost to smuggling, whose monopoly was in the hands of the two half-communities. 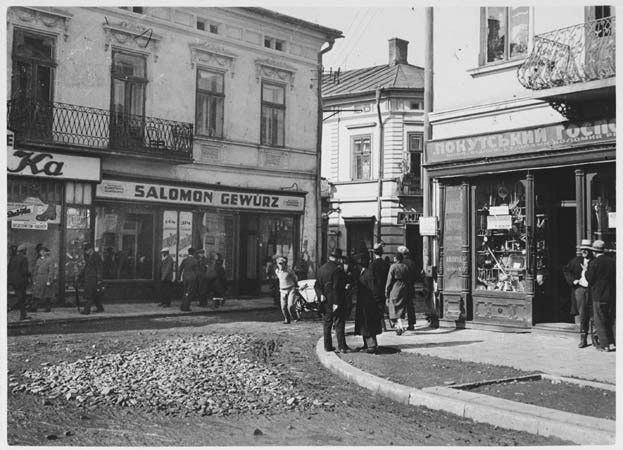 The Hasidic population of Kuty, occupied by Germany in 1941, disappeared, but that of Viznitsa, which fell under Romanian occupation, has survived to this day. Both villages have a wonderful Hasidic cemetery, which are among the most beautiful ones in the whole Ukraine. At the cemetery of Kuty we will stop for a visit. 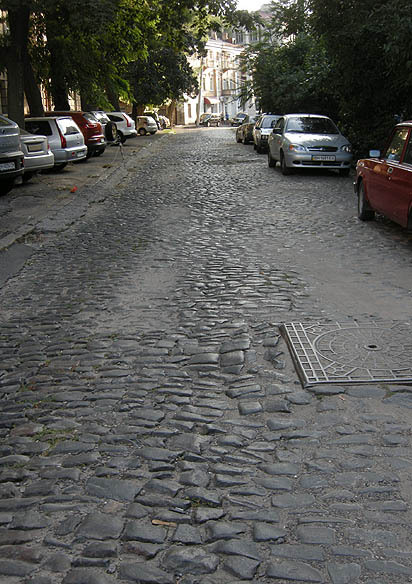 i) Czernowitz / Chernivtsi / טשערנאוויץ. Should I talk much about it? Yes, but in many separate posts, and also along the way, as it deserves. The capital of Bukovina, the most Jewish city of the former Monarchy, “Little Vienna” and “Jerusalem along the Prut” at once, where they nevertheless cultivated the purest German-language literature, and where Jewish community life lives its renaissance today. We will spend a whole day by visiting the once multi-ethnic city, and will also meet the Jewish community who are waiting for us with great joy. j) Sadagura / סאדיגורא. The luxurious palace of the Tsaddik of Ruzhyn over the Prut, which has survived for several decades as a canning factory, but today is in the possession of Czernowitz’s Jewish community again. Its renovation was just completed in last autumn, so in the spring we will see it in its renewed splendor. h) Hotin / Khotin’s castle on the bank of the Dniester: the most important Polish border fortress, which for centuries withstood the Ottoman conquest, and which played a decisive role in assembling the Polish army, with which in 1683 King Jan Sobieski liberated Vienna, besieged by the Turks. Today it is counted among “the seven wonders of the Ukraine”: we will see, why. The letter h – before others notice it – should stay of course before the i and j, but these twin letters were just as suitable to mark the twin towns of Czernowitz and Sadagura, as the h to indicate Hotin. A similarly stirring-up change of rhythm, so necessary on the long bus route, will be induced once more, by carrying forward the m indicating Medzhibozh. k) Kamenets-Podolsk / קאָמענעץ. We are actively working to make this wonderful town known not just from its black fame of 1941, at least in Hungary, and this stop is also in the service of this PR. Nevertheless, we will also commemorate our “stateless” Jewish compatriots executed here. 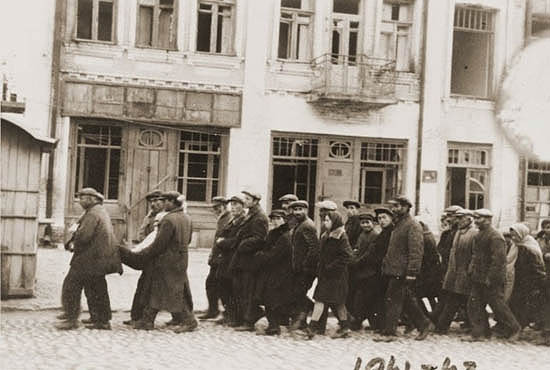 Secretly taken photo by the Hungarian Jewish forced laborer and lorry driver Gyula Spitz, on the Hungarian Jews taken to execution, Kamenets-Podolsk, 1941.
m) Medzhibozh / מעזשביזש. 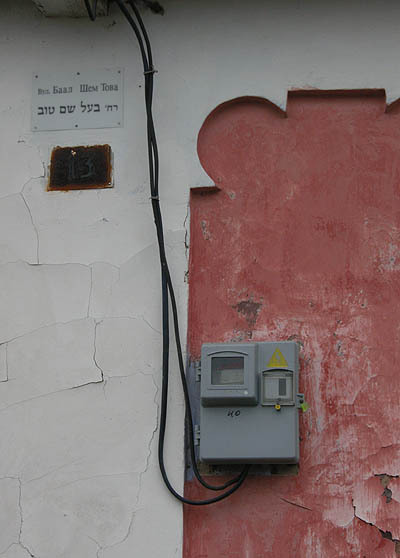 Grave of the founder of Hasidism Baal Shem Tov, around which an entire Hasidic pilgrimage center has been built up in recent years. A beautiful little town, melting into the surrounding nature, and boasting with a centuries old fortress and monuments, and perhaps the only one in the Ukraine, where the street labels are both in Ukrainian and Hebrew! l) Vinnyica / ויניצא. Before WWII one of the major Jewish settlements in the Ukraine, whose complete extermination is documented by the infamous SS-photo bearing the inscription of “the last Jew of Vinnitsa”. Hitler wanted to make it the center of the conquered Eastern territories, and thus he built up the gigantic Werwolf-Führerhauptquartier, whose ruins are still visible next to the city. We will just pass through this city of bad memory and an impressive example of socialist realist architecture, and will have a lunch after it. n) Uman / אומאן. The Hasidic center also known as “the little Jerusalem”, the largest Jewish center of modern Ukraine was established above the grave of one of the most important figures of Hasidism, Rabbi Nachman of Breslav, the great-grandson of Baal Shem Tov. On the occasion of Rosh Hashahah, as we have already written about it, Hasidic pilgrims come here by ten thousands from all around the world. We will also visit the lively Jewish quarter and Rabbi Nachman’s grave at our last stop before moving on to the Moscow-Kiev-Odessa highway, the smoothest route of our journey. o) Odessa / אדעס, our trip destination, the city of the Black Sea Mediterranean, Neo-Classicist promenades, thieves’ songs, gangsters of the Moldavanka, once the third largest Jewish community in the world. How could we write briefly about it? In fact, we will write long, in the time before the trip, every two-three days. Until then please read the common post by the participants of our autumn tour to Odessa, which followed the same route.